Every goddamn day: 04/18/19: What do you get for a friend in rehab? This. There are no "Hooray You're in Rehab!" cards, that I know of. There should be. Swapping a life that's gone off the rails for one that's functional, fulfilling and disciplined should be a cause for celebration, not shame. 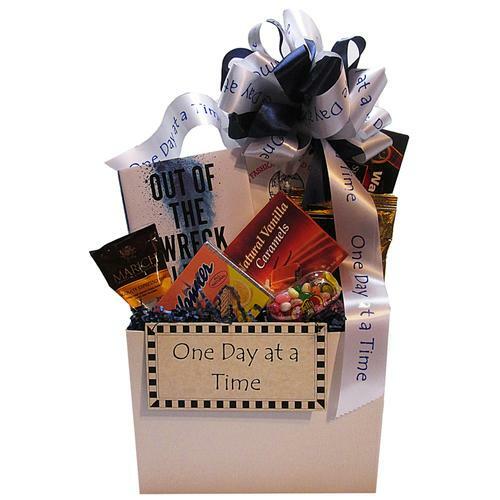 Which is why I was delighted when my friend Lise Schleicher, who owns BasketWorks in Northbrook, suggested creating a One Day At a Time Recovery gift basket around my new book, Out of the Wreck I Rise: A Literary Companion to Recovery, written with Sara Bader. She's been doing land-office business with her Chicago Reads basket featuring my Chicago memoir, You Were Never in Chicago, and was looking to do some brand extension. And yes, I sign the books for those who want me to. Lise consulted with me designing her basket, and I suggested the sweets—sugar touches the part of the brain that booze wallops, and you tend to go through a lot of candy in the early days of rehab. Coffee of course. And the "One Day at a Time" sign because you need that one-foot-in-front-of-the-other determination to get through those arduous first months of recovery. And the book, which has been out now for about two months.. It's still getting notice—just last week Newcity ran a perceptive review by lit editor Toni Nealie. I also taped a podcast that I thought went very well for the Poetry Foundation which should be up any day. And in a few weeks Sara and I will go into the studio to cut a segment with Scott Simon for "All Things Considered" on NPR. With gift-giving season approaching, I wanted to spotlight Lise's new basket. I've used her company before, and can attest that she's prompt and the baskets are wildly appreciated. Particularly under these circumstances, when a person tends to feel alone, facing a life radically different from the life they've become accustomed to. They could use some support, and nothing says, "I'm with you" like a basket of goodies. I believe this sort of thing could catch on. It's a great idea. very cool idea -- it really is something to congratulate folks for! This basket is beautiful! What a great idea. I know it (along with your book) will help a lot of people, just when they need it the most. The candy will help too. My Dad used to say the only time he had a taste for sweets was when he wasn't drinking. I also like the one day at a time mantra. I think having a saying you can look at daily really helps. Anytime I'm having a bad day I look at a message that says, "Please give me the strength to change the things I should, the patience to accept the things I can't change and the wisdom to know the difference." Last year, I read an article about Emily McDowell, a woman who wrote greeting cards that said what the ones bought at Hallmark would never say, but that should be said to someone who is mourning or who is going through something difficult. Many of them are funny or sassy, making fun of the type of things people say to those who are ill or have suffered a loss. One of my favorites says "When life give you lemons, I won't tell you about my cousin's friend who died of lemons." I guess lots of people read about her from the multiple write-ups and radio interviews she has done, and her cards are now being sold nationwide, and are at 25 stores in Chicago. 'Journey'. (Unless someone takes you on a cruise.)" Rehab cards seem like a natural addition to her line - maybe you could suggest a writing partnership? Maybe I should. Though I don't know if I could be as clever as she. I love the gift basket concept. Taking the "shame" out of the discussion of rehab and replacing it with something encouraging and positive could be a real difference-maker.